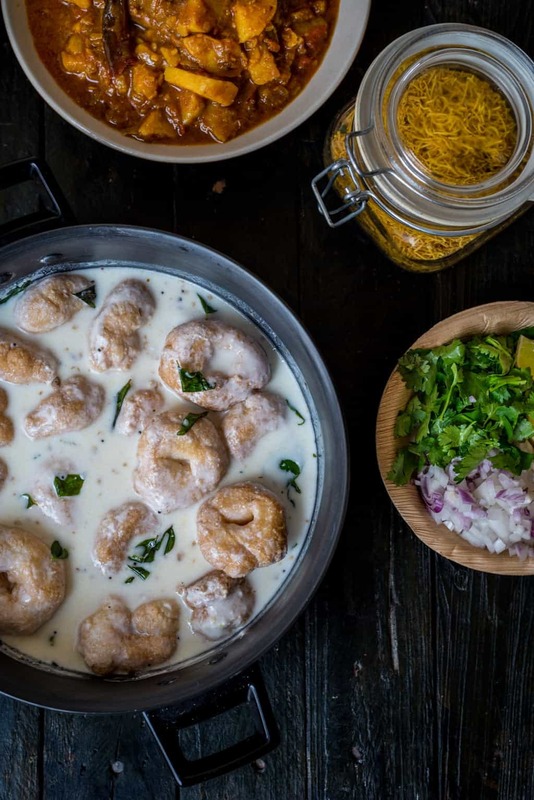 Dahi Bara and Aloo Dum. A famous street food of Odisha.And I am sure every Odiya who have been staying away from their home must be craving for this. You would find vendors with big handis(vessels) hanging on both the sides of bicycles selling these on the streets. 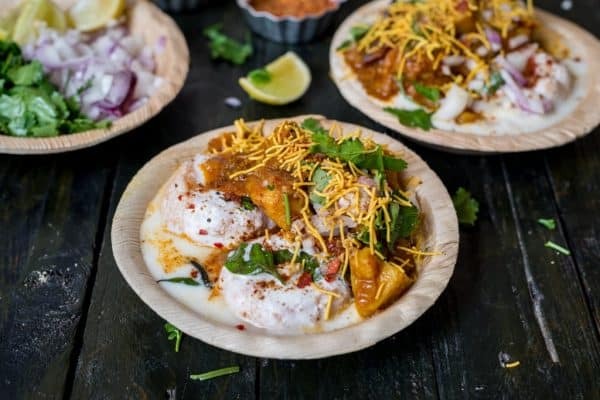 If you have ever been to Cuttack or Bhubaneswar you would have had the best Dahi baras there. 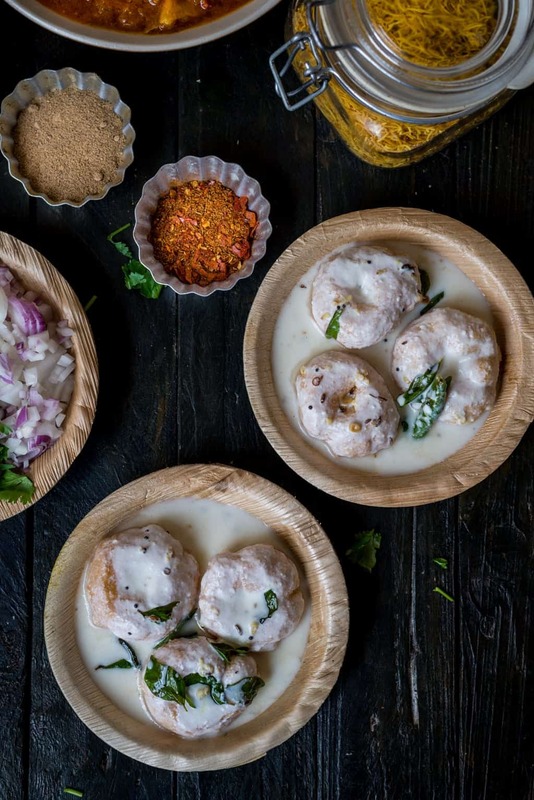 Dahi vada is very common in different parts of India, so as aloo dum. But this combination is something you would find only in Odisha. The vadas are comparatively smaller in size and the curd base is also a little bit on the thinner side. One more thing that brings all the elements together is roasted cumin and dry red chilli powder dusted on top. If ever you are going to try this don’t miss the roasted cumin and dry red chilli powder at any cost. I am sure you just can’t stop yourself with a single serving. Now that we have holi around the corner, it would be the best thing you can prepare. You can prepare this a day ahead and chill in the refrigerator. And 30 minutes before serving remove the Vadas outside. While serving heat Aloo dum and serve on vadas. I am also linking up this recipe to my blogger friend Sonal’s holi recipe round up on her blog simplyvegetarian777. Do visit her blog for some more interesting collection of recipes for holi. For Making Dahi Vada : Make a thick paste by grinding soaked urad dal. (try not to add too much of water else it will be difficult to shape the vada later). Add salt and rava. Mix and keep aside. In a big wide container mix curd, water, grated ginger, grated mango ginger(if using).Keep aside. In a pan heat 1 tbsp oil. Add mustard seeds, Cumin, Urad dal, Curry leaves, dry red chillies, split green chilli. When the mustard seeds starts to crackle and the tampering is aromatic switch off the gas. Let it cool down for 5 minutes and then add to curd mixture. Next beat the urad dal paste vigorously using your hand. It's the difficult but most crucial step of the process. The more you beat, the more you will incorporate air into the batter. To know the batter is ready, drop a small piece of batter into the water. If it floats then consider it as ready, else some more muscle work. Heat oil in a kadhai for deep frying the vada. When the oil is medium-high hot take small portions of batter and shape it. Slowly slide into the hot oil. The oil should not be too hot, else the vadas will remain undercooked. You would see the vadas will start floating. Drop in some more shaped vadas into the oil. Don't overcrowd the pan. Fry till the they look light golden brown in colour on both the sides. Once the vadas are done, remove them from oil using a slotted spoon and put immediately into the water. Let them sit in water for 5-8 minutes. Then remove from water and squeeze the vadas in between two palms to drain excess water. Add to curd mixture. Repeat the above frying, soaking in water and finally putting into the curd mixture process for the remaining batter. Carefully turn the vadas ones ,so that they are evenly soaked in curd.While the Vadas are soaking in curd mixture we will prepare Aloo Dum. _For Aloo _Dum : In a pan heat 2 tbsp oil. Add dry red chilies, tej patta. Add asafoetida. Add chopped Onion and fry till brown in colour. Add Ginger garlic paste.Fry till the raw smell is gone. Add Chopped tomatoes. Cook until the tomatoes are soft and mushy. Add turmeric powder, Cumin , coriander powder, red chilli powder. Fry/bhuno until the oil is separated. Add cubed potatoes. Fry for 6-7 minutes, till the potatoes are nicely coated with the spices and browned. Add garam masala. Mix well. Add water. Bring the curry to a boil, roughly for 10 minutes. Serve dahi bara, topped with warm Aloo dum and garnished with chopped onion, sev, coriander leaves. And off-course dusted with lots of roasted cumin,red chilli powder and chat masala. 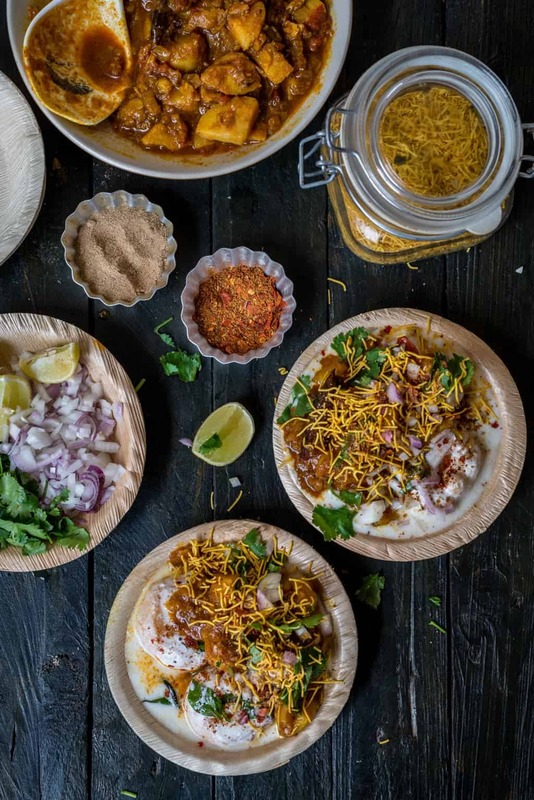 I have never had spicy aloo with dahi vada but uff the pics tell me its super tastyyy. Take me to Cuttack na or best take me to ur house. Unique recipe! 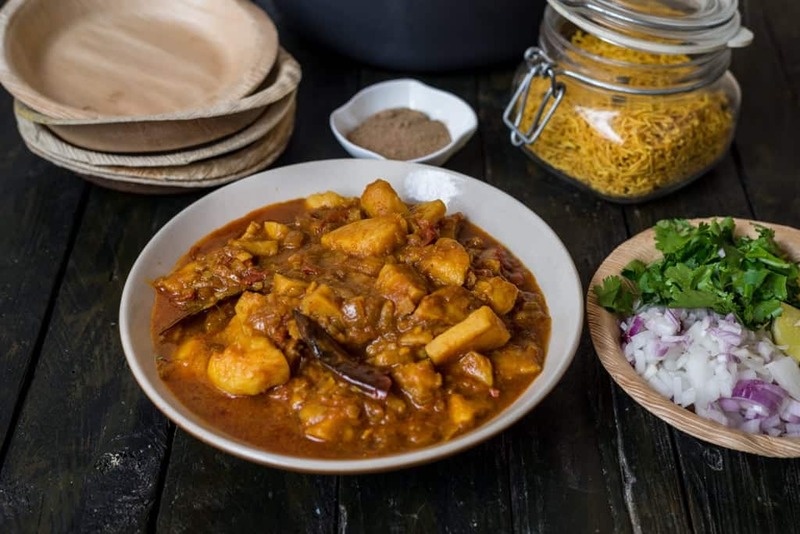 Share some more authentic oriya recipe. I finally got a chance to read this post and loved it to bits! You totally made my mouth water Subha!